Bovision is transforming itself from an ailing real estate vertical into a property search engine. It is the first of its kind for Sweeden. Reposted with permission from AIM Group‘s Classified Intelligence Report. Bovision in Sweden is transforming itself from an ailing real estate vertical into a property search engine — the first of its kind in the country. The company has launched a test site and is looking to grow from its current small team of two employees. Peter Rydås bought Bovision in 2012 after having been a consultant to Finnish media company Alma Media. Bovision was the first classified site for real estate in Sweden, but never had a chance to compete when the Realtor organizations and the leading Swedish newspapers started Hemnet. 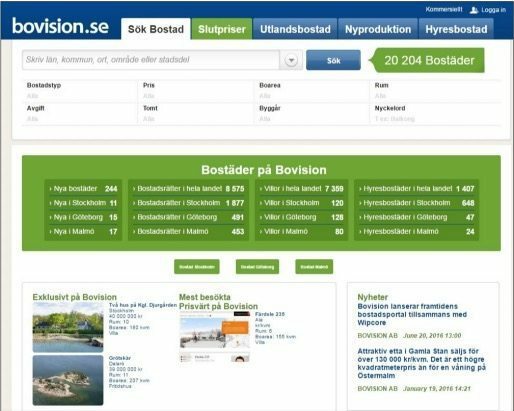 Last year, industry observers thought that Bovision was close to the end as a real estate site in a market where leaders Hemnet and Schibsted-owned Blocket Bostad are dominant. Then suddenly, in Dec. 2015 Schibsted announced that it had agreed with Bovision to transfer all Blocket Bostad ads to Bovision during a two-year period, as the Norwegian giant was about to acquire rival platform Hemnet. The Bovision founder described this moment as akin to winning the lottery. However, things got complicated as the Swedish Competition Authority stepped in to assess the acquisition, potentially deeming it monopolistic. The entire deal has been on hold since (we wrote about it in CIR17.10, May 26th). As a result, Rydås has had to delay the introduction of the new search engine site and might have to push ahead without the Blocket ads if the legal process continues to stall the Hemnet deal. The former newspaper CEO is confident though that his new venture, which is more of a Google search than a traditional classified, has a bright future. “We used a platform called React, the same as Facebook and Google are using. What is nice is the search. You can write anything — area, type of object, real estate agent — because everything in the database is an object description so you can search lengthwise and cross-wise,” he said. To handle the new traffic, maybe as many as 500,000 unique visitors per week that could come with the Blocket ads, Bovision has put the site in the clouds with the help of Ipeer. Rydås does not know of any other real estate classified site using the React platform, but it is more common among sites that provide a search for hotels in the travel industry. “Traditionally, a database search means that if you search for apartments in Stockholm, you go to the database, and it brings all apartments back to you, but then you feel it was too much so you narrow down your search for a ‘two-room apartment.’ Even then, you feel that it is too much and want to narrow it down to apartments less than 60 square meters in size, and the search engine goes back to the database again,” he said. However, Bovision’s search engine has a different system. The site takes all the results and places them into the user’s web browser in microseconds. The user can then filter or rank the information he receives based on factors such as price, date, size and so on. Considering the new Bovision venture has been financed on limited resources (we know that he spent at least SEK603,000, $72,000 U.S., for research and development last year, due to public records), there is a strong future if more resources come in. The upcoming court ruling in the Hemnet monopoly case might also be pivotal to the platform’s future. There is a strong future for Bovision if more resources come in.